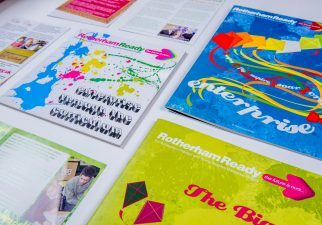 Award-winning forerunner to Ready Unlimited, Rotherham Ready was a borough-wide enterprise education programme operating across the 4-19 age range, for all abilities. Sero created the original marketing engagement strategy to support take-up of the programme by schools, as well as to build the programme’s brand and reputation. Our support also included marketing services, building and running the website and providing all print materials. This included coming up with the distinctive ‘Make £5 blossom’ campaign and designing a wide range of distinctive resources for use in schools, noted in the very positive Ousted evaluation of the programme.